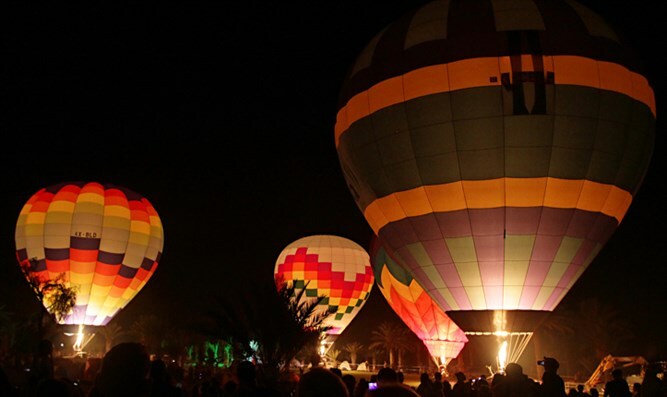 Organizers of Negev hot air balloon festival which was cancelled due to Hamas rockets vow to fly their balloons in show of strength. The organizers of a hot air balloon festival which was cancelled due to the security situation in the south have pledged to fly their balloons in the face of Hamas rockets. The event, which was planned to take place Besor National Park in the Merchavim regional council in the Negev Desert, was officially cancelled Thursday. "After much deliberation, in view of the security situation, the hot-air balloon festival will not take place this year and you are entitled to a full refund,” the Shikma Beshur Tourism Association announced. However, the organizers later stated that they intend to come to the park Friday morning and fly the balloons despite the cancellation. "They will not take our air. "We will arrive tomorrow to fly balloons of peace and hot air balloons, as a symbol of the optimism that characterizes our special region and the residents of the south." Merchavim regional council head Shai Hajaj welcomed the initiative. "We can not allow the ongoing security situation to harm our strength, and this is an impressive and special festival, with over 5,000 people of all ages coming to us every year, and we intend to continue this tradition. Our balloon flyers come from around the world with a message of peace that crosses borders. We were very disappointed by the cancellation of the event, and were happy to have the opportunity to fly the balloons despite this. " Due to the security tension, the public will not be able to enter the compound when the balloons are flown. The Besor National Park is just nine miles from the Gaza border. Terrorists from the Hamas-run enclave have launched hundreds of rockets and mortars at southern Israel over since Wednesday night.